You don’t need me to tell you that cell phones have taken over the world. Most of us remember the first one we got, “just for emergencies.” Twenty-five years later, they’re the one possession we worry most about breaking or losing. Leave home without your wallet? You’ll probably risk driving anyway, and beg a coworker for lunch money. But leave home without your phone and there’s a good chance you’re turning around to get it. No matter who you are, you have a phone. It’s not 1988 folks, it’s not just this guy who has a phone. You don’t have to be a doctor, a lawyer, or a captain of industry. Everyone, even the people who build buildings, has a phone. And everyone, with no exceptions, gets annoyed when they don’t work. Why do construction sites have bad cell service? A construction site is one of the worst possible places to get cell service. Walk ten feet in any direction you may have great service, but on the site you might have nothing. There are several reasons for that. Those big machines might be putting out a lot of interference. Of course, anything that could potentially put out interference is inspected by the FCC before it can be built. But construction equipment lives a hard life. Some of the shielding that made it pass inspection could be in shreds. Construction sites have temporary power lines strung all over the place. Again, this is supposed to be tested beforehand to make sure there’s no interference. But hey, things happen. Those electrical lines could be making it hard for the signals to get to your phone. So you’re putting up a big building and there are big pieces of metal everywhere. This could very easily cause problems for you. Those problems won’t go away when the job is done but at least you’ll move on. Hopefully the building owner will consider a good cell booster system. Stucco mesh and temporary fencing does a surprisingly good job blocking cell signals. So good, in fact, that the same materials are used to build Faraday cages where cell phones are tested. This temporary material could be causing real problems for you. In cities, cell tower usage is watched very carefully. Bringing a couple hundred construction workers into a formerly empty lot might just overload them, and you lose signal. It’s also possible that if it was an empty lot, there wasn’t a cell tower terribly close. First of all you can add a cell booster in the office. The very same Connect RV65 that works well for tailgaters also works well in construction offices. It’s durable enough to take the punishment of a construction site. The Connect RV65 also designed for a temporary installation, which is just what you need. It’s a little harder if you’re trying to improve signal quality on site. Putting a cell booster outdoors doesn’t usually work. You can put up an access point and let people use Wi-Fi calling if you want. You can also find a spot where there really isn’t any service at all, such as the center of the construction site, and put a booster there. However, having even one bar outside can stop a cell booster from working. It’s hard to say but there’s not a really perfect solution. However, the best one seems to be putting cell boosters in all the temporary buildings. At least you’re not too far from a signal at that point. And really, you shouldn’t be checking Instagram when there’s all that construction stuff going on around you. 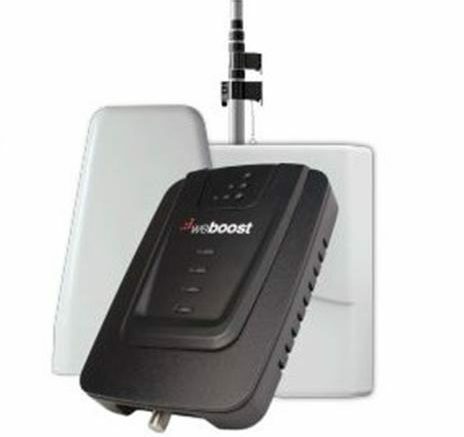 If you’re looking for a cellular signal booster for work or for home, shop for the best selection and get the best advice by shopping at Solid Signal. What’s the best way to aim a cell antenna?